Welcome to my passion - pattern welding. As you can see, all of my work is made by hand in my forge. I do not buy in patterned bar stock from suppliers then grind it to shape. The pattern welding shown here should not be confused with Damascus or watered steel which is mainly the eastern method of steel blade manufacture. All of my pattern welded blades are constructed of layered and twisted rods. These rods are hammer welded together side by side with the twists running in alternate directions. It is this which gives the finished blade the herringbone effect. 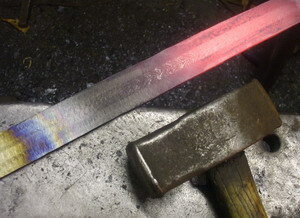 On to the herringbone core are welded either 1 or 2 carbon steel edges depending on the design. This combined herringbone core with hardened steel edges gives the blade the pattern so typical of the best North Western European blades from the 3rd century through to the 9th century. The hard edge surround coupled with the softer central core gives a very tough blade with the mechanical properties of both the hard but brittle and soft but springy metals complementing each other in the blade's function. 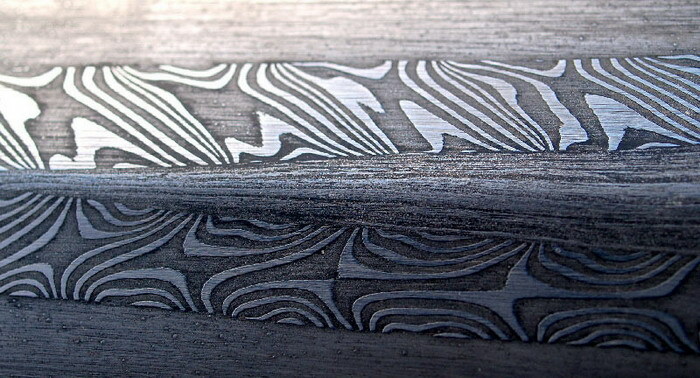 Each blade I produce is acid etched after it is finished to highlight the pattern. Besides being attractive this lays bare the blade's weld boundaries and makes visual inspection of the construction possible. In the past this would give the prospective buyer information on the blades makeup - the number of layers, the degree of twist, the number of core composites and edge depth, amongst other properties. In short, it forms an inbuilt guarantee of quality. I hope you enjoy looking at these blades as much as I enjoy making them. A close up of a spearhead blade showing the wrought iron core which leads into the socket. This is flanked by two pattern welded bands which are in turn surrounded by a carbon steel edge. The picture below is a close up of and interupted twist. The core is composed of three bundles of alternating wrought iron and carbon steel layers and each bundle is composed of twenty two layers. The bundles are hammerwelded to form a rod which is then twisted but only for short sections, leaving a section of straight, untwisted rod interspaced between each. These rods are then placed together and hammerwelded such that the straight and twisted sections coincide with each other across the cores width. This was a very typical pattern for the period. It is somewhat challenging in that time is needed to ensure the twisted section brings the rod around such that the edge layered side of the rod is always exposed to the blades face. The three rods then need to be placed such that the twisted and untwisted sections coincide neatly and symmetrically before the core is welded.